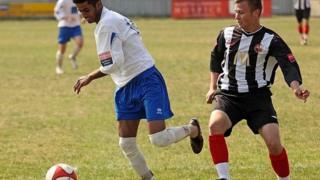 A man has denied murdering a former non-league footballer who was stabbed to death. Jack Taylor, 18, from Oakley Close in Grays, Essex, is accused of killing Kevin Malthouse in the town during the early hours of 1 July. The 24-year-old, who played for Tilbury Football Club between 2011 and 2014, was stabbed in the chest. Mr Taylor also pleaded not guilty to three counts of wounding with intent at Chelmsford Crown Court on Tuesday. He is due to stand trial on 20 November.